Following a weekend incident involving armed pro-Confederate demonstrators on campus, UNC interim chancellor Kevin Guskiewicz says he’s taking several steps to ensure safety on campus. Guskiewicz says he’s launching a review of the incident in question. He’s also convening a campus safety commission to examine “all aspects of community safety,” including relationships between UNC police and the campus community. More broadly, he says he’ll be meeting with campus groups on how to better promote inclusion and racial equity at UNC. The incident took place on Saturday, March 16, when a small group of pro-Confederate protesters gathered on campus. At least one of them was armed with a handgun, in violation of a state law banning firearms on campus. The demonstrators left campus at the request of UNC police, but UNC has since come under fire for not making any arrests. Earlier this week, UNC issued a statement saying they would make arrests in similar situations in the future. 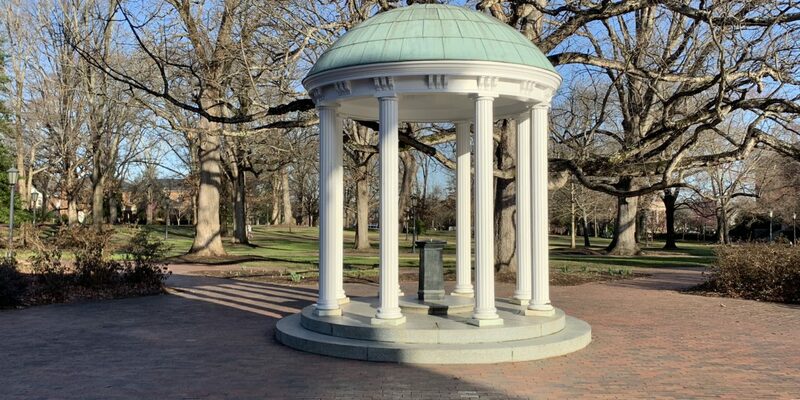 But the statement did not stem the tide of criticism: some faculty and staff members launched a Twitter account, Unsafe @ UNC, charging that UNC’s approach was endangering campus safety. By now, many of you have heard accounts of a disturbing incident that took place on campus Saturday when Confederate supporters walked through campus with a handgun. Fortunately, UNC Police prevented the situation from escalating and asked that individual to leave campus. To be clear, weapons, especially guns and the threat they convey even when holstered, have no place here and will not be tolerated. In the future, those found with a weapon on campus will be arrested and issued a warning of trespass. Over the past few days, I have heard questions about how the event unfolded, the interpretation of state law and what we can learn from this incident moving forward. I want to share with you the actions my leadership team and I are taking to help ensure that any future incidents are handled consistently and in a manner reflecting our community’s values. First, I am convening a campus safety commission to take a broader look at all aspects of community safety, including building relationships with campus police. Composed of students, faculty and staff, this group will engage in dialogue, foster trust, enhance our collective good and advise me of their recommendations. I will announce the members of this commission and further outline their charge within the next month. Second, in the coming weeks, I will meet with a variety of campus groups to hear directly how the community envisions our work to eliminate racism and inequality while promoting equity and inclusion on campus. As we implement our strategic framework, these concerns should be addressed in our goals and priorities. Third, consistent with recommendations I have received from students, faculty and staff, I am initiating a review of the incident that took place last Saturday. I will also convene an assessment team to review all significant campus police actions and major emergency management and public safety events in the future. These reviews are important so we can understand the facts and incorporate lessons learned to strengthen our processes for best policing and emergency management practices on campus. We will share the recommendations emanating from these reviews with you. We must nurture an environment where all people in our community can live, learn and work without fear. The increasingly heated rhetoric aimed at our community – both online and here on our campus – can make that difficult. Our University has a history of successfully navigating tough issues. I am confident that we will come together to foster an inclusive culture in which all members of our community feel safe, like they belong and can flourish.